Getting started -- Scrape each seed a few times over coarse sandpaper or a nail file. Then soak them in a cup of water for 1 to 2 days (not more than 2 days). Soil -- Use well-draining soil. I use a mix of 1 part coir fiber to 1 part perlite (use small- or medium-grade perlite, not large chunks) . An alternate mix is 2 parts potting soil to 1 parts perlite or coarse horticultural sand. Use small pots or cups that have drainage holes. Fill them with soil, place a seed on top, and cover with 1/4 inch (7 mm) of soil. Add water until the soil is evenly moist (but not soggy). Keep the pots between 64-78 degrees F (18-26 Celsius) during the day, and a little cooler at night. I haven't tried them outside this temperature range. I recommend placing a minimum/maximum thermometer near the pots. The seeds tend to sprout at different times, ranging from 4 weeks to 4 months. Once they sprout, give them bright light, such as morning sun, filtered sun, or bright LED or fluorescent lights (See: "Growing indoors with LED lights"). Protect them from strong afternoon sun the first few months. If any seeds don't sprout after 4 months, expose them to cool nights (below 55°F / 13°C, but above freezing) to simulate the passing of winter. An easy way to do this is to seal the pots in a plastic container and put them in the refrigerator. Mark your calendar to remove them after 8 weeks. Watering -- Aim to keep the soil evenly moist (but not constantly saturated). After the first year, they can tolerate drier soil. 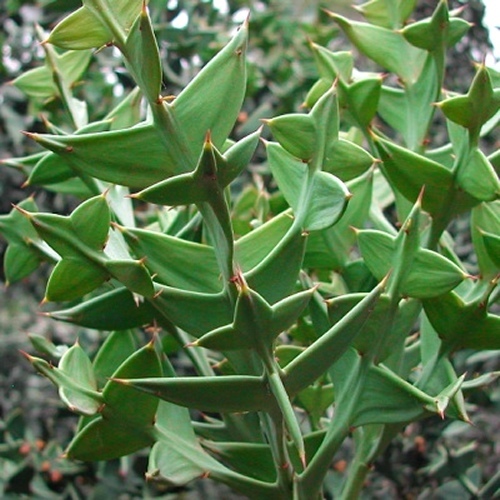 Climate -- The plant comes from low- to mid-elevations in Chile, where summers are warm and nights are cool. It's possible that hot days with warm nights could stress it, but i suspect it can adapt. It can handle a few degrees of frost (-4°C), but it's best to protect it from prolonged frost, especially when young. I would protect them from very high or low temperatures the first 6-12 months. Fertilizing -- When they are 7 days old, feed weekly with a small amount of liquid fertilizer using a very dilute dose (1/8 strength). Hydroponic fertilizer is ideal for young seedlings, because it is easily absorbed and complete. After 2 months, you may switch to a granular fertilizer if you prefer. Choose one with micronutrients, and follow the dosage on the package. Repotting -- When the seedlings are 2 inches (5 cm) tall, they may gently transferred to bigger pots. Avoid disturbing the roots when repotting. Repot into a fast draining soil. If you live in a high rainfall area, or you tend to overwater your plants, use ample perlite or coarse sand in your mix. Bugs to watch for -- Not usually bothered by pests. Indoors, watch for spider mites or mealy bugs. If any questions or problems come up, feel free to email me.